OK - what brought you to this site? Quite likely, the word ‘Pruning’ brought you here. 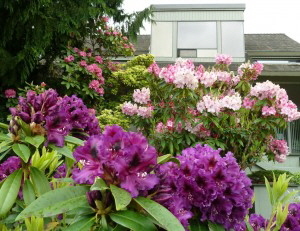 Perhaps, shrubs and trees in the yard are becoming a problem rather than attractive components of the landscaping. At some point in the past, shrubs and trees were planted and looked ‘just perfect’. Possibly there was an exuberance of creating beauty that led to ‘over-planting’ -- too many things were planted and now there is crowding and choking as maturing proceeded. Certain times of the year, especially in spring, great beauty is still visible but then the realization sets in that it’s all too much and something has to be done about it. Shrubs that started at 3 feet have grown to 8 or 10 feet or even larger. Then, comes the quick and cheap solution -- get them ‘trimmed’ or ‘shaved’. Now they look like large ball shapes -- still full, but blooms get smaller and the inner part of the shrub is dead and dry and the branches get weaker and ‘willowy’ -- NOT a pretty sight. Of course, to keep the shrubs green on the outside, they have to be allowed to get larger and gain in girth. This can’t go on and on -- after 12 to 15 years something has to be done. It’s time to CONSULT and consider advice from the > Pruning Guy. leads to more attractive appearance and healthier growth. Check back once in a while for added content.